Although residents of the United States and Great Britain theoretically speak a mutually intelligible language, there are enough differences to make for an amusing and entertaining study. 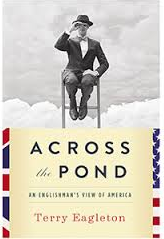 In the book Across the Pond: An Englishman's View of America by Terry Eagleton, various aspects of the two versions of English are compared and the reasons for the differences in meaning and expression are explored. Historical comments on the American character from authors such as De Tocqueville and Dickens are also included. In addition to different ways of speaking, Americans and British people also have very different approaches to the world in general. British people go out of their way to be reserved, quiet, and avoid unnecessary attention. Americans, on the other hand, are much more open, accessible and free with their opinions. Why should this be so? The author presents several interesting explanations. For instance, in the United States, we generally have not had a history of obvious class divisions. Every child is constantly told that he or she can be whatever they want, as long as they work hard for it. In traditional British society, you were born into a class and generally stayed there. American pioneers, with their straight-laced Puritan backgrounds, had to immediately get to work, and therefore developed a more direct and honest approach to language. The aristocratic class in Britain, with nothing to do but enjoy their leisure, developed a more florid and ironic manner of speech. On the other hand, more recent events in history in Europe have somewhat put a damper on the expression of things like patriotism, nationalism and heroism, things that are never far from the surface in any American form of expression. Additionally, Americans are not afraid to be sentimental in public, with politicians, newsreaders, judges and other public figures often tearing up when in front of a microphone and camera. In Britain, such display of emotion would be considered unseemly, embarrassing and somewhat vulgar. The author attributes this lack of emotion on the part of the British to not wanting to show weakness in front of their "social inferiors" or "colonial subjects." Americans and British people don't just differ in language, according to the author. He claims that American, upper and lower class Britons, and Irish Catholics and Protestants are all dissimilar enough in appearance as to be instantly recognizable and labeled. There is also a discussion of the American tendency to bend and interpret religion to suit whatever purpose is required. Americans frequently insistent that, because the country is so prosperous, it must mean that God likes us best and therefore it's perfectly fine (if not a downright duty!) for us to "share" our values and culture with the rest of the world. In the words of Mr. Eagleton, "sometimes you have to destroy the world to save it." America's puritanical roots also show in their tendency to blame and punish people who fail to conform to societal norms. Not only must the weak and guilty be punished, but those doing the punishing seem to take irrational delight in the misfortunes of these miscreants. If you are successful, it is because of your hard work and determination, and if you aren't -- well, that must be because of something you did as well. There is also the tendency in the US to think that human beings are inherently bad, and therefore signs and notices prohibiting all conceivable forms of misconduct confront the casual visitor everywhere. No mention of the British penchant for CCTV cameras covering nearly every inch of the British isles, though! The differing national characters are also apparent in terms of the solitary nature of the British, compared to their more outgoing, gregarious American cousins. The British people do not get worked up about government or politics, unless it impinges on their ability to get on with their lives without too much interference. The Americans, on the other hand, get worked up at government regulation of almost any sort -- it might interfere with their ability to make a profit. The British love to grumble and complain, chiefly about things that are out of their control (like the weather). They also take a morbid delight in negative things; trying to one-up your neighbor with tales of medical disasters, domestic breakdowns and job-related negligence is a national pastime. This is not generally the case in the US, where striving for achievement is the all-consuming passion. I thought this was a very fascinating look at the evolution of two forms of English, as well as the differing national characteristics of the United States and Britain. One thing I found somewhat amusing was that when the author was attempting to illustrate a point by making up a supposed quote by a typical American, there were some "Britishisms" included. For instance, he discusses the American tendency for "chatty book titles" by mentioning a fictional one titled Phobia: How I Learnt to Conquer My Fear of People Who Have Squeaky Voices and Are Under Five Feet Eight Inches Tall. However, I've never heard an American use the word "learnt" so this fictional title he mentioned must have been the British edition!